So this recipe took a few tries to get the taste I was looking for. The first round looked pretty but was a little too dry from a thick layer of phyllo dough and not enough flavor from the cheese. The most recent round really came together nicely and has the flavor, moisture, and crunch I was dreaming about. 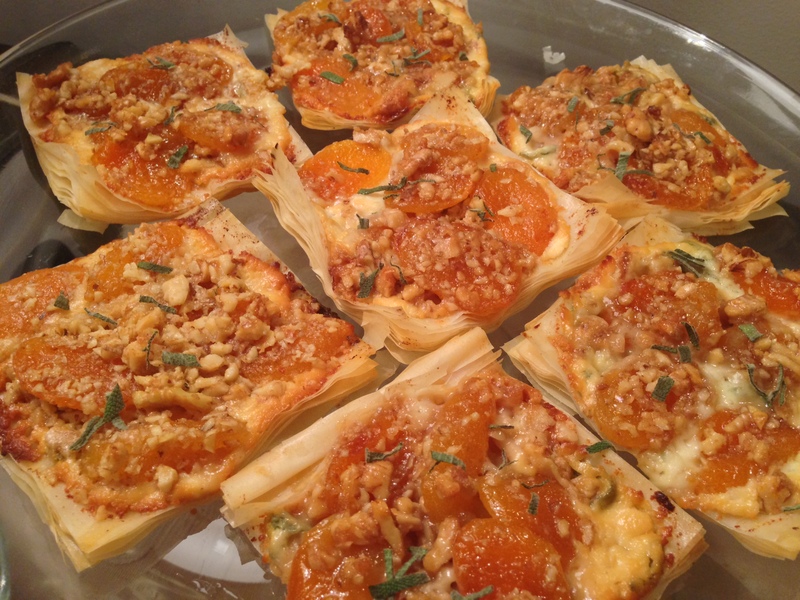 These are good for a small gathering or a quick dessert for a last minute occasion. I used sage this time, but it would also be great with Thyme as I had used the first round. 1. 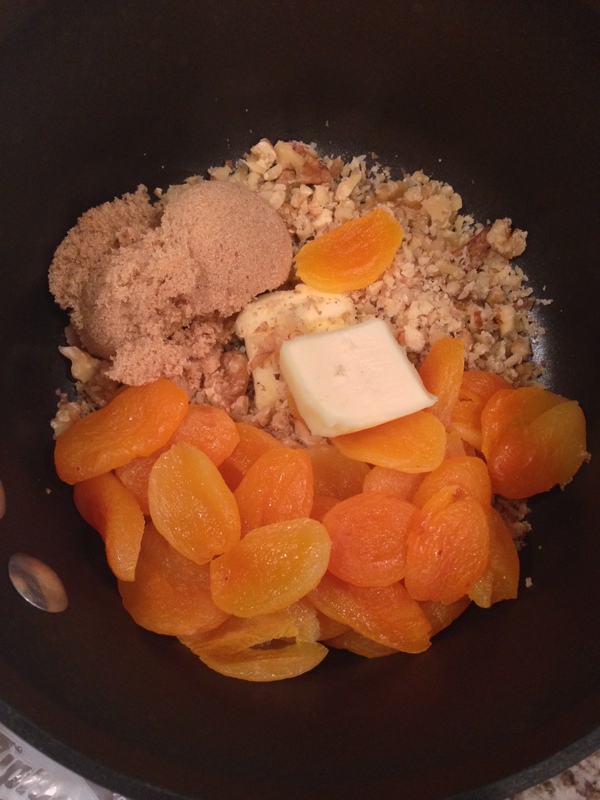 In a small sauce pan make your toppings by mixing apricots, brown sugar, chopped walnuts, and 1 Tbsp of butter. Warm over medium heat until butter and brown sugar is melted making a glaze coating the nuts and apricots. 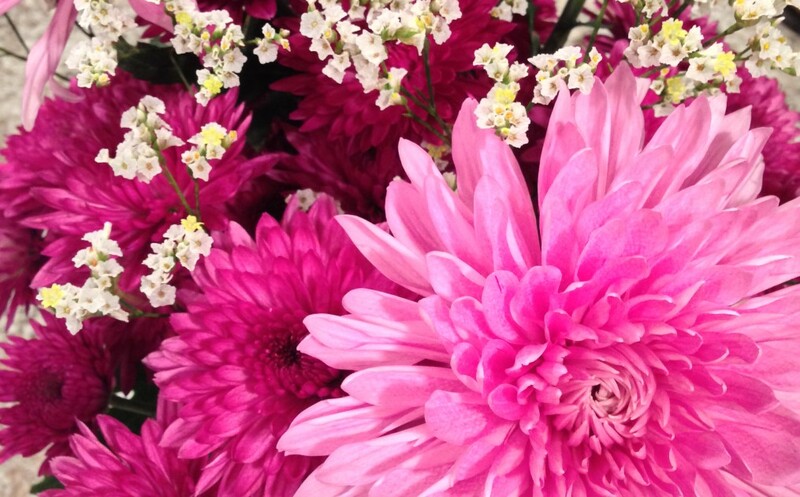 Remove from heat and set aside in a small bowl. 2. 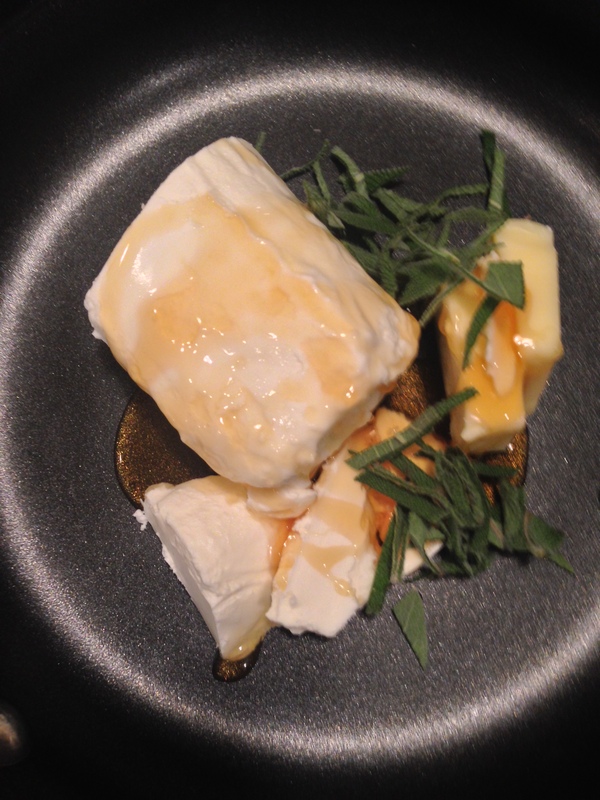 In second sauce pan heat goat cheese, 1 Tbsp butter, 1 Tbsp sage, and honey over medium heat. When cheese melts and consistency is of an alfredo sauce remove from heat, do not boil. 3. 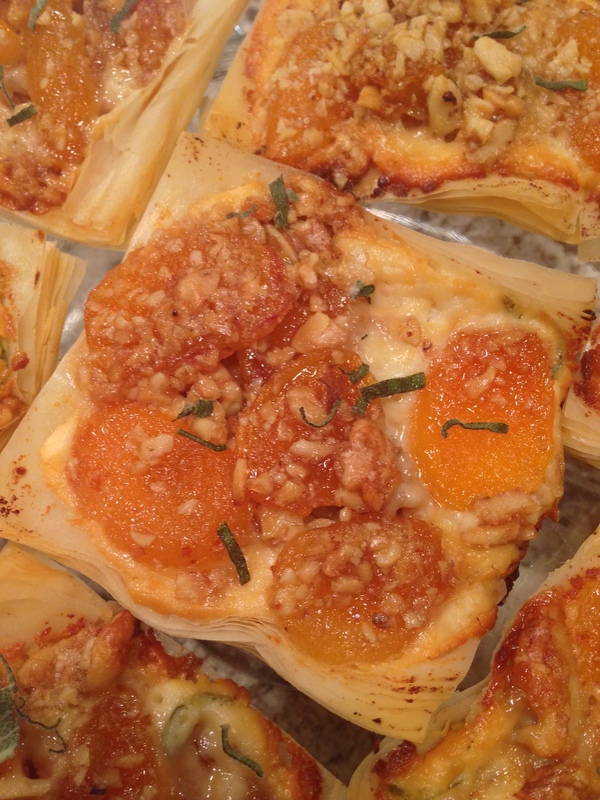 Lay phyllo dough flat and cut into 3×3 inch squares or slightly larger, split into pieces that are 6-8 leafs thick. The first time I made these I kept the original stack thickness and it was too much, half that is good. Separate on a cookie sheet. 4. 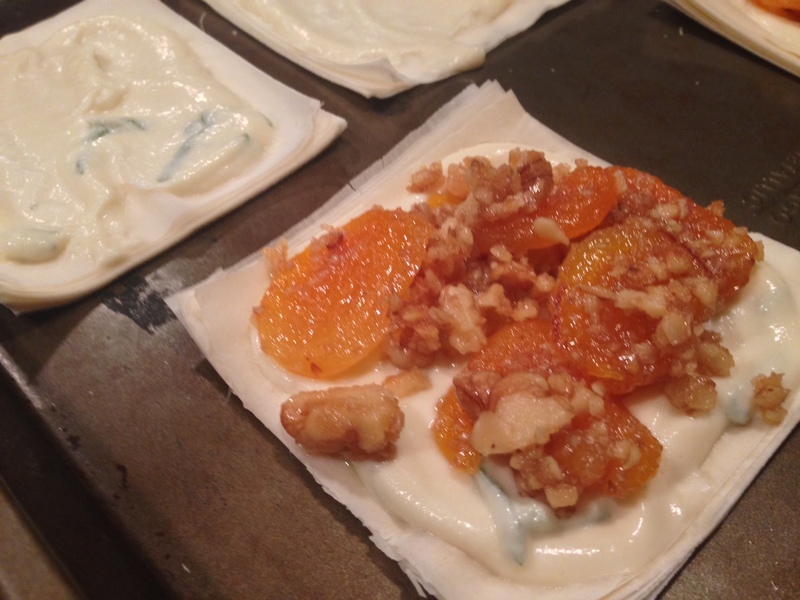 Spread the cheese mixture onto the squares then top with apricot and nut mixture. 5. Brush edges with remaining 1 Tbsp of butter, melted. Bake in oven at 350 for 10-15 minutes until lightly browned. 6. Garnish with remaining sage and serve warm.